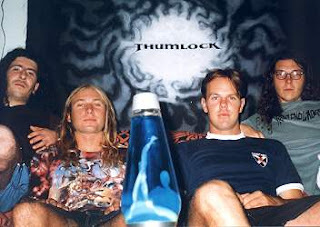 With the exception of Tumbleweed, it's fair to say that Thumlock ruled the local rock scene throughout the nineties. 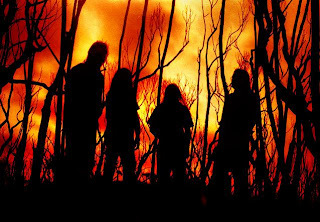 Drawing heavily from the stoner and seventies heavy rock scenes Thumlock carved their niche in the Australian rock landscape which. at the time was looking to desert rock acts such as Kyuss, and associated stoner labels such as Tee Pee in New York and Meteor City in Detroit. Forming in '94 by Ben Lough (guitar/vocals). Greg Eshman (drums) and Wayne Stokes (bass), the band earned their keep on local stages, managing to pool enough funds to enter Main Street Studios to record a four-song, self-titled demo at the end of '95. Though the band's songcraft was still clearly in it's infancy, there are glimpses of things to come on the demo, both musically and lyrically. The strongest track of the four was 'Planet Neptune' with it's cosmic overtones - a feature that would become one of the bands' trademarks. The demo helped the band get some stagetime alongside bands such as Shifter, Dettol and Mudlungs, and in '97 the trio again entered the studio (this time heading to Sydney's Powerhouse) armed with a bunch of new songs. Again relying on their own funds, the band recorded and released the five-track EP Dripping Silver Heat demonstrating a marked improvement in song structure and a clearer musical direction. Again the cosmic nature of the music, lyrics and artwork indicated a band that was finding it's place in the world. The two years that followed were significant to the bands' subsequent career. The trio soon added Raff Iacurto on second guitar who would soon become pivotal to Thumlock with his penchant for writing memorable and groove-laden riffs. 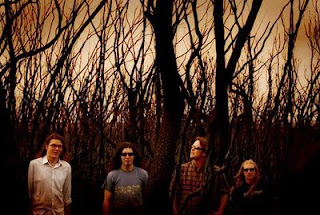 The band also teamed up with budding local music-mogul Jeb Taylor who would go on to first manage the band, then launch a label that would become a vehicle for Thumlock's releases, as well as become a significant part of Wollongong's musical heritage. Taylor encouraged the newly-expanded line-up to re-enter the studios in '99, during which time they recorded the now-classic Lunar Mountain Sunrise EP. Starting with a droning, rumbling intro, Lunar... shook the Wollongong scene to it's core. Together with Tumbleweed, Thumlock were announcing to the world that the mediocrity of the industrial city between the mountains and the sea was coming to an end. Again laced with psychedelic artwork and lyrics influenced by sci-fi writers such as Michael Moorecock and Frank Herbert, Lunar... saw the band hit new stratospheres. Though there are musical references to Blue Cheer, Pink Floyd and Black Sabbath the band also drew inspiration from their surrounding environment. The cover is graced by a large moon-like planet hovering over the escarpment, whilst the title of 'Jaspers Brush' is taken from a small town down Berry-way. Lunar... received rave reviews both here and overseas, and it wasn't long before the band returned to the studios to record Emerald Liquid Odyssey - their first album-proper. By the time boys emerged, Taylor had established High Beam Music and was ready to launch the career of what was fast becoming Australia's premier stoner act. Emerald... featured beautiful artwork by Pauli Brennan depicting a phoenix rising from the surf, and was capitalised upon by Simon Dalla Pozza's layout resulting in a finely packaged album not expected from a DIY label based in Wollongong's northern suburbs. Again, Thumlock had surpassed their own expectations musically, with the album taking a decidedly more high-octane approach without losing it's sludgey, psychedelic edge. 'Planet Neptune' is revived for the first time since their demo days and the opening track 'Rockin' Course' is lifted as a single, getting the band some much needed airplay. 'Rockin' Course', along with crowd favourite 'Water' highlighted the bands maturity and - for the first time - their ability to write songs that were less than five minutes in length. The album was picked up by Beard of Stars for a European release, hit #4 on the Australian Independent Record charts and received Album of the Week in Drum Media. 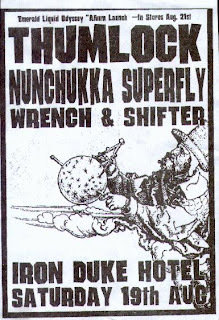 Thumlock were soon invited to share stages with Nebula, Rollins Band and their heroes Hawkwind, as well as contribute 'Out of Focus' to a Blue Cheer tribute album that also featured underground legends Pentagram. As the machine kept rolling so did Thumlock. Touring the country extensively over the next 12 months, the band hardly had time to draw breath before they were back in the studio recording their follow-up album, Sojourns Lucid Magic. Shedding any prog-sentimentalities they may have still held onto during the recording of Emerald..., the songwriting on Sojourns... was even more concise with the lead single 'Modulator' falling below the three-minute mark. The straight-forward rock the band had hinted at previously was further on display on Sojourns... perhaps alienating a large portion of their audience. Though not a bad album, it lacks the mystical flavour of their previous work, with the songs, as punchy and direct as they are, fail to leave a lasting memory once the final power chord has faded away. As is often the case when you throw a bunch of young blokes into a Tarago for hours on end, the cost of being on the road began to take its toll. The band were offered a slot on a Eurpean tour with Nebula and Monkey Wrench, but despite solid sales, neither High Beam or Beard of Stars were able to support the tour financially. The band continued to push Sojourns... locally but it wasn't long before it became clear that, despite the latest albums' title, the lucid magic of Thumlock was waning. In 2002, less than 12 months after the release of Sojourns... Thumlock called it a day. Eshman went on to form the short-lived El Sanchez, whilst the remaining three formed the highly-energized, but equally short-lived ROADS. These days Eshman resides in Melbourne and occasionally drums for The Hard-Ons and Front End Loader, Lough lives in London, Iacurto performs around Sydney as a singer/songwriter, and Stokes lives on the North Coast of NSW. There has been talk of a reunion, and possible reissues, but realistically that won't happen unless Lough returns to the country. Thanks to Jeb Taylor and Wayne Stokes for their assistance in preparing this article and for verifying the accuracy. Fabulous article, and great to see Thumlock finally get a web presence deserving of - and showcasing (in words only, but the downloads are a nice touch) - their talents. Thumlock were my fave Oz band in their day and are sorely missed. I spin their EPS/CDs regularly still and to my mind there has not been anything around since in Oz in the same genre that do it as well as Thumlock did. ROADS dismayed with the change in direction. For me, Thumlock filled the void that Tumbleweed left in the late 90's and nothing has come along to step into the shadow of these two bands since they left us. Cheers to Thumlock - great memories and great music. I've been searching around for the first demo and first two eps for awhile now so thank you very much kind sir! Thumlock had a mystical groove and vibrant sincerity about their riffs that was unique. Not many other local acts really sounded like them and I'll certainly miss their brand of heavy psychedelia. Unfortunately, I never did see them live. I have lots of wonderful memories listening to them during my uni daze and the late 90s crescendo of stoner/doom metal. Thank you for the downloads! Have been trying to track down the older EPs for ages.